This is my third year making a paleo dressing. I simply feel like old-fashioned cornbread dressing is a MUST for a complete Thanksgiving experience. 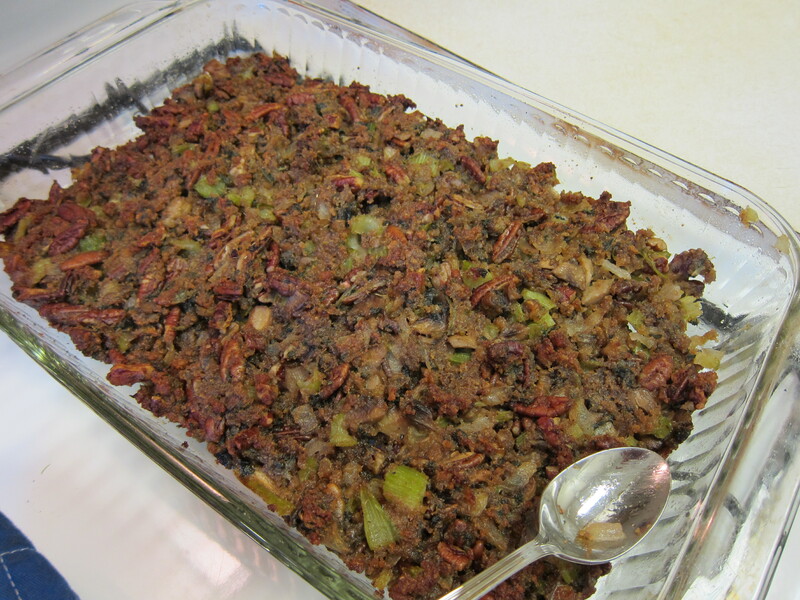 This year I’ve had a few people ask me about paleo dressing (er, “stuffing”) and so I will share the recipe I came up with. To save time and mess, my beloved food processor does all my chopping, dicing, and pulverizing, but you can chop/dice by hand. I prefer the texture when everything is chopped more finely, but other people like it chunkier…to each his own. *Fresh is best, but you may sub poultry seasoning, or dried herbs. 2 tbsp of pre-mixed poultry seasoning, or 1 tsp each of dried sage, thyme and rosemary. Heat butter in a large pan. Saute the celery, onion, mushrooms, sage, rosemary, thyme, garlic powder, salt and pepper and lemon juice until wilted and fragrant….mmm…smells like Thanksgiving. While those are cooking up, grind the chicharrones down into a fine breadcrumb consistency. In a large bowl, mix the ground chicharrones, finely diced pecans, broth and 3 eggs. When the sauteed veggies have cooled a little, add them, including their juices, to the chicharrones/pecan mixture, stir until mixed well. Bake in a greased 9×9 dish at 350 degrees for 30 minutes, until the edges are brown and crispy. Happy Thanksgiving, friends. Enjoy a long walk with your friends/family, and eat good food with gratitude. Relax, and retreat from the web. Indulge yourself on what you love most, and remember that relationships are more important than food!